High quality, same day minor car body repairs in Shrewsbury, with Guaranteed results, and superb customer service. Get your car looking great and worth more by repairing your scuffs, scratches, dents and wheels without fuss or breaking the bank. Excellent service, high quality results, all work guaranteed. Call in for a FREE written estimate from our friendly, experienced staff while you wait. Dent removal services for car park dents are usually removed using PDR (Paintless Dent Removal) in just a few hours. Larger accidental damage can also be repaired quickly & economically at our Shrewsbury car body shop. If you have stone chip damage on your bonnet or bumper caused by stone chippings, we carry out stone chip repairs at our Shrewsbury car body shop. Call in for a FREE no obligation written quote today and see how quickly & easily we can get your car protected again. Your ACE alloy wheel repair shop in Shrewsbury can repair minor alloy wheel damage eg kerb damage & rim scuffs usually in just 1 day. We also carry out colour changes and full alloy wheel refurbishment services, including diamond turned finishes. From plastic welding splits on motorbike panels, to scuff repairs as well as custom colours schemes, Ace Car Care can meet your needs. And keep it looking great with our paint protection films. Welcome to ACE Car Body Repair Shrewsbury – the low-cost / high quality solution to car body repairs in Shrewsbury, Telford and the surrounding Shropshire area. If you need car body repairs on your car, van, motorbike, motorhome or caravan, we can repair your everyday wear and tear and minor accident damage in our fully equipped car body shop in Shrewsbury using the ACE localised repair system. Your car scratches, bumper scuffs, cracks and splits, minor dents, kerbed and scratched alloy wheels and general paintwork damage can be repaired quickly and economically without fuss. As well as this, we also specialise in styling and tuning your vehicle with services like window tinting, scuff protection film, parking sensors, graphics and vehicle engine remapping which you can find on our main website. If you take pride in your vehicle, don’t put up with those frustrating dents, scuffs, dings and scratches. You can get professional quality repairs at a fraction of main dealer car body shop prices, and all of the work we carry out for you is guaranteed. Get your on-line car body repair price guide to get an idea of how much your car body repairs Shrewsbury will cost, to get your motor back to the way you want it looking. Our friendly and personal service will save you £££’s – you’ll be amazed at the results we can achieve! 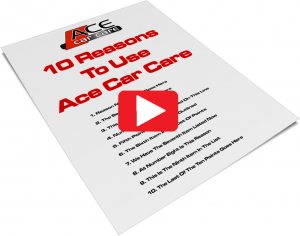 Ace Car Care Reviews – Here’s What Our Customers Say….. If you click the image opposite, it will start our Shrewsbury Car Body Repair introduction video, which discusses what you can expect from us at our Car Care Centre. You may recognise us from the photo opposite, as we have been local car body repairs Shrewsbury specialist for some time now. We were formerly based at Benbow Business Park, on Harlescott Lane (at the back of Furrows), but now work at our larger and more extensively equipped Car Care Centre on Vanguard Way, Battlefield Enterprise Park, Shrewsbury.